"Caramel apple bars loaded with apples, cinnamon, and actual caramels." Cover the bottom of a 9x13-inch baking dish with pastry for 1 1/2 pie shells, cutting the pastry to fit and filling gaps as necessary. Stir apples, sugar, flour, and cinnamon together in a large bowl to coat the apple slices. 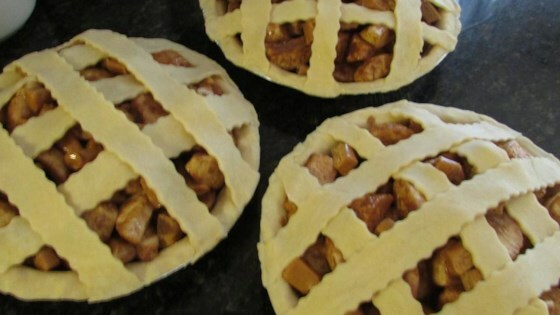 Layer apple mixture over pie crust. Arrange caramels and butter slices on top of apple mixture. Cut remaining pie pastry into 1- to 2-inch pieces; arrange atop the caramels and butter. Bake in preheated oven until just beginning to brown, about 1 hour. Cool in baking dish on a wire rack for 30 minutes, cut into bars. Beat milk and confectioner's sugar together in a small bowl; drizzle over bars.